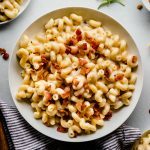 This easy bacon mac and cheese recipe has crispy bacon, fresh rosemary, and sharp white cheddar cheese sauce! I’m going to go ahead and start a petition to make macaroni and cheese its own official food group. (Welcome to Life As A Strawberry, where we focus on the big issues). I’m equal parts mac and cheese traditionalist (noodles + plain cheese sauce = HEAVEN) and add-all-the-things-ist (veggies! protein! greens! herbs! trash it uuuuuuup), so it’s a safe bet that I’m going to fangirl over just about any mac and cheese you put in front of me. But this BACON mac and cheese? Gamechanger. 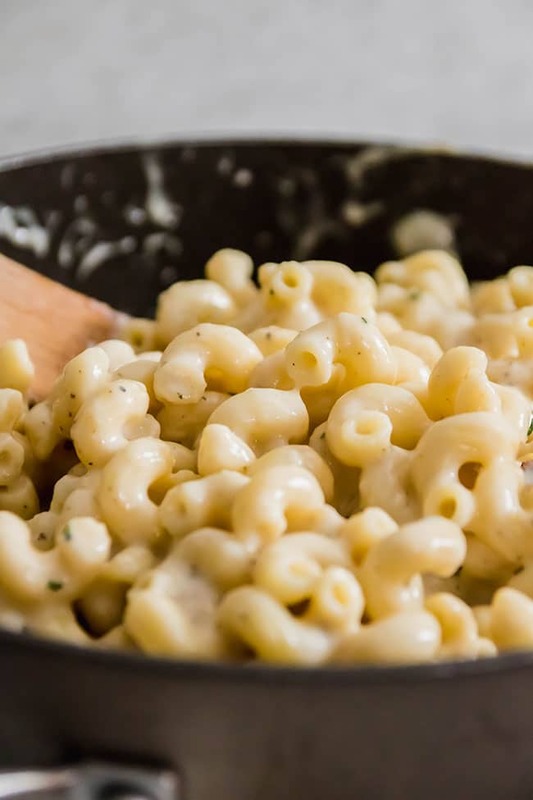 (Also HEY HI PS – If you want to trash up artistically create your own ultra gourmet mac and cheese recipe, you should check out Mac and Cheese 101, because it covers everythinnggggggg and I give you all my top secret secrets). 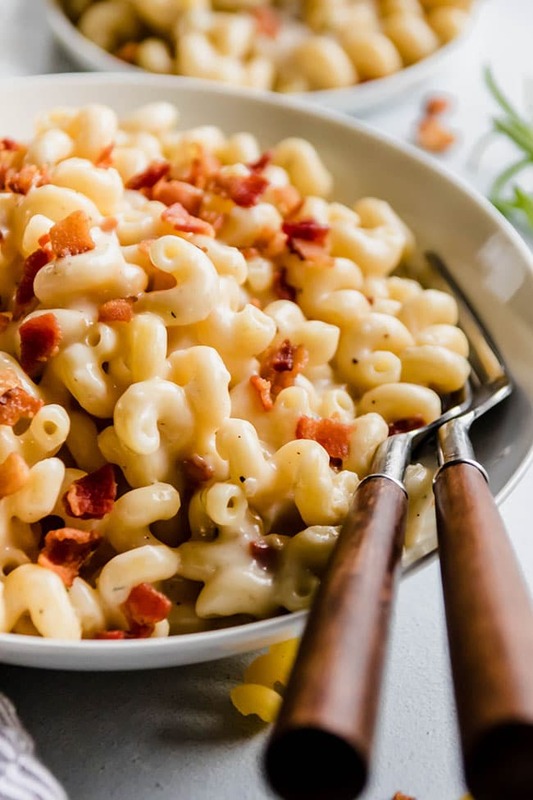 There’s a creamy white cheddar cheese sauce here, with plenty of crispy bacon (of courseeeeee), and this macaroni and cheese gets a flavor boost from fresh rosemary and garlic for some extra pizzazz. (pizzazzzzzz is the bezzzzt). Seriously, though – once you try this creamy rosemary cheese sauce, you’re never going back. Cook pasta in salty-like-the-sea water. Seriously. SALT THAT WATER, PEOPLE! Cook up some bacon. Set the crispy bacon aside and leave the fat in the pot to form the base of our sauce because this is not health food. Whip up an easy-peasy garlic and rosemary and white cheddar cheese sauce. Pat yourself on the back for being awesome. Throw it all together. Do a happy dance. Send me a picture on Instagram so I can happy dance, too. 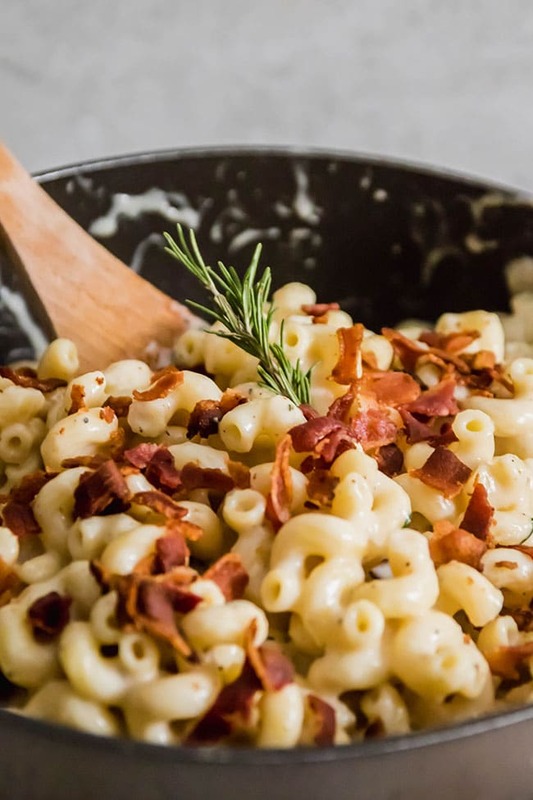 A quick and easy stovetop mac and cheese with bacon, rosemary, and white cheddar. Cook pasta in very salty water until al dente. Drain and set aside. Return pot to stove over medium heat. Add diced bacon and cook, stirring frequently, until crispy. Use a slotted spoon to remove bacon to a paper towel-lined plate. Leave the bacon fat in the pot – you want about 3 tablespoons. Add garlic and rosemary to pot. The bacon fat will be very hot, so keep an eye on the garlic to ensure it doesn’t burn (you can even reduce the heat or turn it off entirely for a minute if you need to). Cook until garlic has softened and is fragrant, about one minute. Add flour to pot and stir to combine. Don’t worry if the bacon fat looks a little foamy here. Add milk to pot a little at a time, whisking constantly to work out any lumps. Cook sauce for 7-9 minutes, stirring frequently, until it’s thickened and reached a low simmer. Remove pot from heat and stir in shredded cheese. Stir constantly until cheese has melted, and then season with salt and pepper to taste. 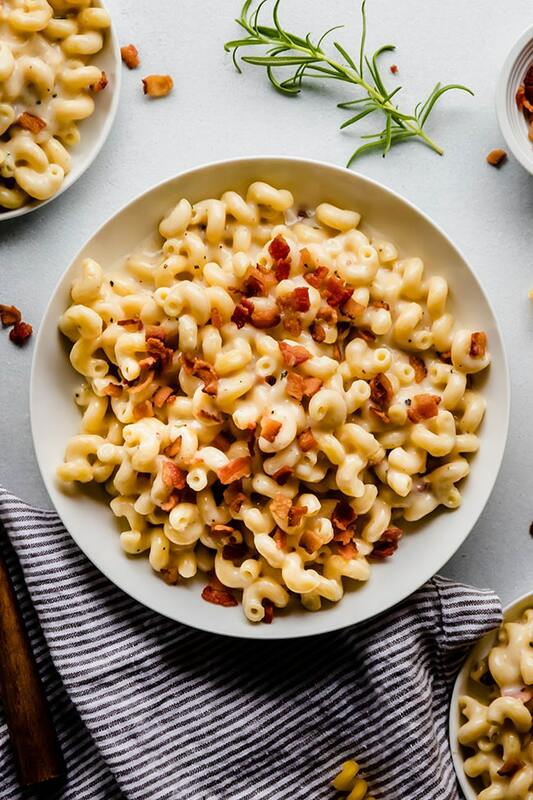 Top mac and cheese with crispy bacon pieces and serve immediately. FOR MY BEST MAC AND CHEESE TIPS, CHECK OUT MAC AND CHEESE 101! Shred your own cheddar cheese if possible – store-bought shredded cheese often has preservatives that prevent the cheese from melting smoothly. If you think there is too much or too little bacon fat left in the pot after cooking the bacon, you can spoon some of it out or add a little bit of butter until it looks right. I generally find that 4 strips of bacon release just the right amount of fat for forming the roux here, and it’s a very forgiving sauce if you have a little more or a little less. If you omit the bacon, use 3 Tbsp. butter in place of the bacon fat to make the roux. Use more or less fresh rosemary depending on the size of your sprigs and your personal preferences. Use 1/2 – 1 tsp. dried rosemary in place of fresh if you like. Substitute 1 cup of chicken stock for 1 cup of the milk to lighten this recipe up a little. Add grilled chicken, salmon, or other proteins or veggies to make this a little heartier. For plain bacon mac and cheese, you can omit the garlic and rosemary. Mix up the cheeses here if you like – this recipe is also great when you swap out some of the white cheddar for gruyere, goat cheese, parmesan, cream cheese, fontina, or havarti. No photo to send, we ate it all! Defs best Mac & cheese I have tasted! I can’t wait to try this. My mouth started salivating by seeing this only. Mac and cheese is my favorite and anytime you give Mac and cheese pasta I will be ready to eat without any limit. And this is kind of different flavor I guess. Because I saw some extra ingredients in the recipe. So I’m definitely going to try this soon and will definitely let you know, how it turned out. Geez, this looks amazing!! 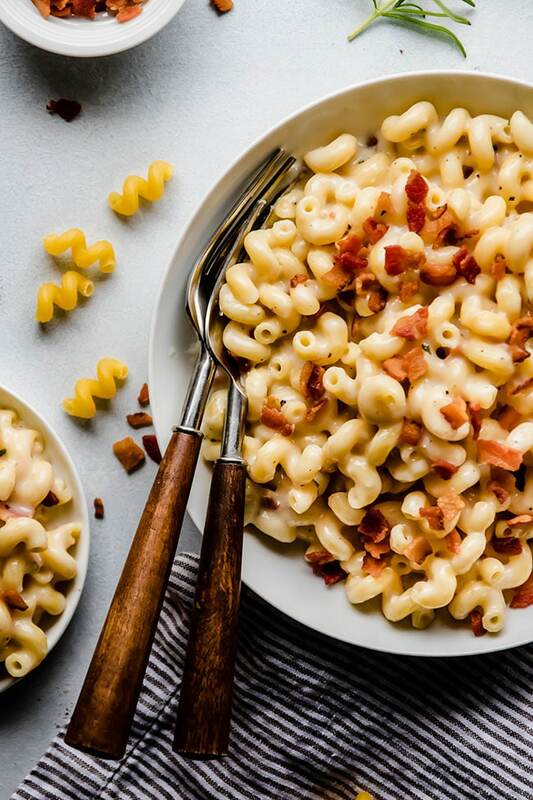 Bacon is the perfect addition to any mac and cheese, but this recipe: O.M.G!! Thanks, Sean! It’s definitely one of our new favorites!